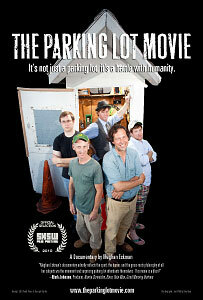 The Parking Lot Movie (Directors: Meghan Eckman and Christopher Hlad): The Corner Parking Lot is located in Charlottesville, Virginia and, over the years, it’s developed into somewhat of a local legend, based on the oddball cast of characters who have inhabited its employment ranks. The 2-acre plot of land, comprised of little more than asphalt and a run-down, comically small parking attendant booth, surrounded by railroad tracks and the unsightly backs of buildings, becomes the unlikely site for an examination of class struggle, capitalism, human interaction, and consumer culture. Such ruminations in The Parking Lot Movie come courtesy of the fringes-of-society, overqualified workers who man the booth. “Man” is the appropriate verb, too, as there isn’t a single woman to be found among the almost two dozen current and former employees who were interviewed. As first-time director Meghan Eckman explains in the film’s press kit, this was a reflection of the fact that so few women have worked at the lot since it opened in 1986. A female perspective would have been welcome, if only to possibly break up the constant stream of bitter, self-righteous, smug viewpoints from the male interviewees, which tend to blur together into a thick fog of negativity that, frankly, just wore me down. Most of the employees interviewed are university graduates and undergraduates who majored in fields like philosophy, religion, and anthropology, and the nature of the job affords them plenty of time to reflect on how the parking lot is really a microcosm of society. Their theories and observations are highly intellectual, but balanced with hostile humour usually rooted in barbs aimed at the lot’s more annoying clientele. The intended laughs from the screening audience were delivered regularly, but I must admit to sitting in my seat stone-faced for most of the movie. Working a lowly service sector job like theirs has enabled the lot attendants to see human behaviour operating at exasperatingly deficient levels, which are recalled with numerous examples involving boorish drunken frat boys and sorority girls, SUV drivers, Prius owners, and a steady supply of condescending (and occasionally law-breaking) customers. I have no doubt it must be a frustrating job to do, but the attendants’ vitriol is delivered with such an elitist, snarky tone that it wasn’t difficult to quickly find most of them as annoying as the easy targets they were criticizing. Also, consider the numerous statements with regard to being “gatekeepers” such as these: “In the parking lot we were dynamos. Whirlwinds. We were rulers. We had complete autonomy”, as well as “Did we play God in the parking lot? I guess we did play God”. And the film’s tagline is “It’s not just a parking lot, it’s a battle with humanity”. Despite the tongue-in-cheek delivery, it all becomes just a little much. Eckman shot the movie with a 4:3 aspect ratio to mimic the claustrophobic conditions of sitting in the cramped attendant booth, which adds to the low-budget look of the movie and makes it feel even more like a real life Clerks (with a little less existential philosophizing). She might also want to revisit her decision to end the documentary with a painful five minute rap video involving some of the attendants – it feels amateurish and jarringly out-of-step with the rest of the movie. This entry was posted in Documentaries, Film Festivals, Hot Docs and tagged #hotdocs10, misanthropy. Bookmark the permalink. Good review, then. Good thing I had zero expectations of this movie to begin with. Wow! You sure can pick’em! Fortunately I haven’t experienced anything quite this bad so far this year.